Get ready for the release of The Hunger Games Mockingjay Part 2 in theaters November 20th by watching the first 3 films of the blockbuster Hunger Games franchise that has taken the world by storm, featuring an all-star cast of Jennifer Lawrence, Josh Hutcherson and Liam Hemsworth. 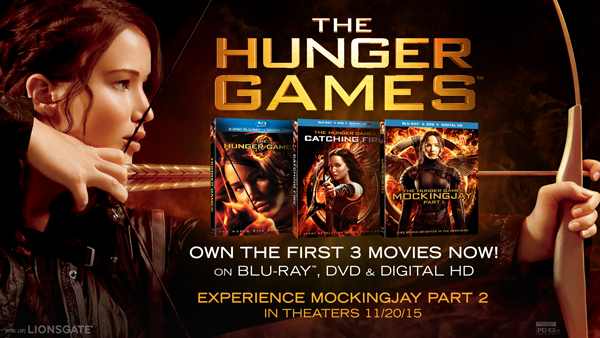 Now, you can own the first 3 films from the epic series on Blu-ray before the theatrical release of Mockingjay Part 2! Own The Hunger Games, The Hunger Games: Catching Fire, and The Hunger Games: Mockingjay Part 1 on Blu-ray now from Lionsgate Entertainment.Register below to win your favorite Hunger Games on DVD!